The world did not end after all, surprise surprise. And I got the best news ever the Thursday before, I passed my advanced accounting class!!! So I am officially done with school for now (who knows, an MBA might be in my future or something) and I am moving onward to the CPA exam in 2013! I wanted to take the time to bid adieu to my not so beloved University of Houston. You will not be missed that much by me. My life expectancy and likelihood of being robbed has decreased substantially. 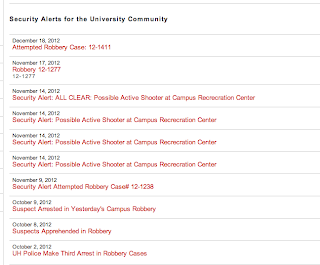 It is going to be a delight to not receive a weekly email from the U of H dept of public safety about the latest armed robbery or car break in going on at my school. This school borders the 'hood. U of H, I know you want to rapidly expand to house your ever growing population of commuter students, but ripping up 50% of the parking lots to build 8 new parking garages to be available in 2015 is really poor planning. There have been times when I attended or visited other universities and thought the parking was bad. 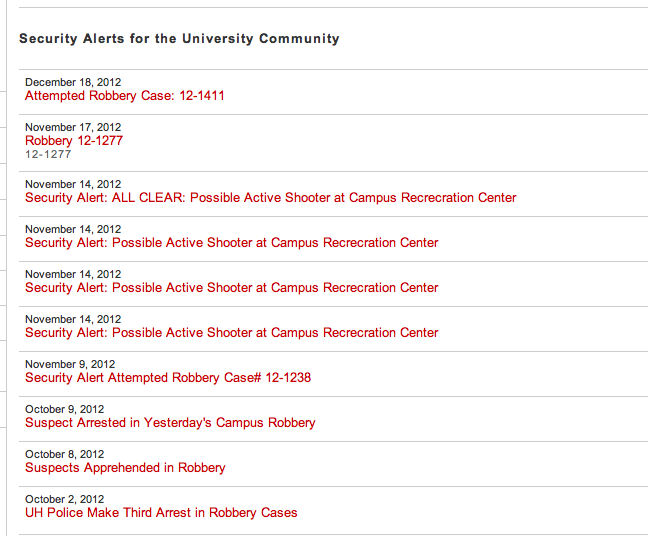 You, U of H, are by far the worst. I only took night classes and STILL at that hour I would have to circle the lot for 30 minutes in hopes of spotting someone leaving so that I could follow them to their spot. My advice to future and current students, get a moped or a motorcycle if you want to have a prayer of a parking spot. Or a bus pass. Parking and life endangerment aside, I have learned a boatload at U of H and my professors have mostly been really good. The school has a really great program in the business school to get you all professionally developed, and there are 1000 opportunities every other week to network with the giant companies in town, along with career fairs and mixers. It really is a pretty decent school, all things considered. Not to mention, all the really great people I have met in classes and on projects and stuff. So thanks for all that U of H.
I am glad to be done with this chapter in my career life and be able to spend my nights and weekends as I please. Now on to the daunting task of the CPA exam! I'm sorry you had to go through all that parking drama though. hahaha :D I know how you feel! Good luck on your CPA exam! You'll pass I'm sure! When you were talking about our math teachers, I didn't know you were at UH! I'm a cougar too! What a small world! !